1) The bizarre notion that Rav Chaim Kanievsky is correctly informed about the different candidates and parties running for election - despite only having met one of them. 2) The notion that people are obligated to follow the dictates of the Charedi Gedolim. 3) The claim that by doing so, one fulfills the mitzvah of V'asisa k'chol asher yorucha - despite the fact that according to the dominant view in the Rishonim, this only applies to the Sanhedrin. 4) The prayer being for children who are talmidei chachamim (i.e. learning in kollel), and who enjoy plentiful, easy parnasah - i.e. being supported by the rest of Israeli society. 5) The transformation of following Daas Torah from a directive to a religious ritual, complete with a prayer. 6) Finally, the most absurd aspect of all: The manipulation of the ritual into something that must follow a specific routine - the prayer must be said after placing the voting slip into the envelope (within a halachically defined minimum time?) in order to be effective! The Hebrew writing at the bottom stresses that this is "Very Important!" By describing how to manipulate the metaphysical forces correctly, it emphasizes the nature of voting for the charedi party as being a mitzvah. 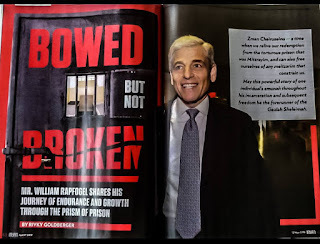 This flyer is perhaps the ultimate example of manipulating Judaism for political ends. Following the charedi side of the elections over the last couple of weeks, I am simply astonished and want to cry gevalt. This is just not Torah Judaism, plain and simple. Lying, name calling, trying to create mass hysteria, physical violence, death threats, insulting venerable Torah scholars who disagree, declaring chiyuv kares for those who vote differently, etc. etc. This is just not our mesorah. I've never supported YCT or "Open Orthodoxy," but I feel what's been happening in charedi society over the last couple of weeks deviates far more off course from the derech haTorah than anything YCT can do. The more times you vote, the more mitzvot! Do you have to say the Yehi Ratzon each time, or just have kavana the first time? I recommend saying the hineni muchan umizuman, but make sure to add the lisheim yichud first. Dovid, it's like I've said before: when Ultraorthodoxy goves off the rails you get riots. When YCT goes off the rails you get a woman leading Kabbalas Shabbos. Which, really, is worse? Jerusalem Post: Eight Charedim arrested for voter fraud. Why is it always charedim? So when do we find out the election results? RBS because it is always them and Arabs but its not politically correct to arrest Arabs soo the Haredim are the only one's arrested. RBS, it is always chareidim and arabs, because it is harder to tell the difference between them, and because of there traditional garments. As a soldier standing in machsomim (road blocks), it was always a challange to correctly identify the arabs with there ID's. This is right up there with the classic parody "Hilchos X-mas"... oh wait, this isn't a parody? At least they didn`t print Hashem`s name on it, so you can toss it in the dumpster. Or line a bird cage with it. They tried the same thing here i Montreal, asking us to vote for one fellow who works in Hatzoloh for town council, and not a woman (gasp ) who is chasidish and does community work, and has a track record. With the Hebrew on the pamphlet appearing like so many squiggles to Temujin, all he could do was to admire the graphic imagery which carried him back to a distant time in his childhood and a place far away when his visual horizon was littered with myriads of posters exhorting the merits of Communism and the dictatorship of the proletariat. Many such inspiring works featured one or more of the Gedo...Greats from the pantheon of International Socialism, usually encircled by a fawning clump of congenital sycophants. Absent of course are the healthy young ladies with the bare arms, all gazing somewhere up and far away into the distance where the future is said to lie, the ubiquitous smoke-belching factory chimneys and the deep crimson colour schemes. In his mind's eyes, Temujin can edit the photo on the present flier, imagining a well-fed, white-bearded Marx surrounded by a worshipful trio of heroes of Socialist labour representing the pillars of the Inevitable Future. Thus the stern-looking fellow scowling bravely at the viewer represents the Guardians of the New Order, the beardless chap a thoughtful member of the intelligentsia or nomenklatura and the astounded, eager looking bloke holding onto the stender, a member of the simple, jolly, hard-working People on whose labours and production capacity potentials the next Five Year Plan depends. Had Temujin been near his electronic contraption, he would have enjoyed Photoshopping the droll pic for the edification and amusement of his friends here. The way you talk about (6), are you opposed to Yaakov splitting his camp and praying to God? Should he have only stuck to one? Yaakov's two camps didn't attack each other. To the creator of this flyer: Next time you publish Hebrew text with nekudot, for goodness' sake, please consult with someone who knows some basics of Hebrew grammar. this flyer was everywhere in bnei brak. My God. That is horrific. "This flyer is perhaps the ultimate example of manipulating Judaism for political ends." I wouldn't say its manipulating judaism because that is not judaism.but, I would say that they are manipulating innocent jews who don't know better. I dislike chareidi philosophy/ideology very much. But at the end of the day we must remember these people who the poster are meant for were born in this vicious evolving cycle of a type of brainwashing . and are forced to disregard individualism. who were taught to relegate major and alot of times minor thought processes. so we must also feel sorry for them. Because this is all they know. Can't the gedolim (or those writing their lines) use punctuation or good grammar? One who votes the wrong way is, "embarrassing a talmid chochom with no portion of Olam Habah." Guy on the right: "I'm anxious to drink up the words of this great Torah sage - you know, the words I just put in his mouth?" Middle guy: "Ok, this is stooping pretty low, even for me, but it's for the good - meaning it'll help me keep my job." Mayor Abutbol: "I'm not sure who this Ashkenazi gadol is, but I'm going to try really hard to look at him as if I've ever in my life cared about his psak before." I like to learn proper Dikduk. Can someone explain the grammar flaws? Also what does the Bnei Brak poster Ben Waxman linked say? imma, you have children at home, a family. you spill tears in prayer, only wishing that they should be healthy and well, that they should live their lives in peace. YOU ARE ABOUT TO VOTE, but the ballot slip could be playing with fire! HaGaon Rav Kanyevski shlita, yes! the one who you quote to reassure children terrified about war with syria, terror attacks, arabs: "nothing will happen in bnei brak, that is what rav kanyevski promised". 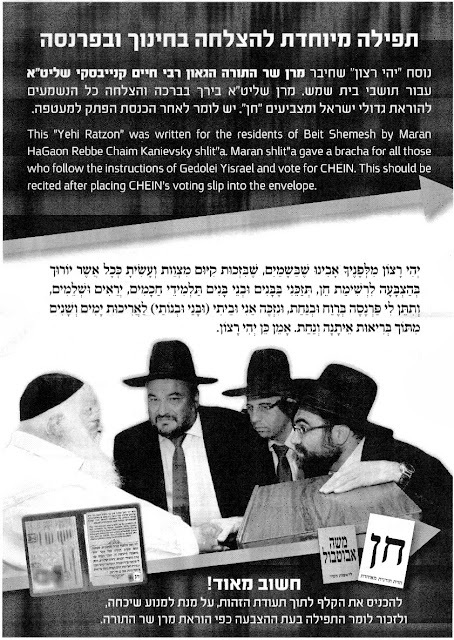 "anyone who votes for a party list against (the wishes) of rav schteinman is disgracing a talmid chacham. that person doesn't a have place in the world to come. there is no cure for his disease and everyone needs to distance himself from them lest they perish along with the wicked, god forbid!" you, as a mother, understand the implications. you are with them (your children everyday, giving them a warm embrace and praying that they return home safely. you understand the implication of having the gadol hador angry with you. you have children - they should be well BS"D.
my comment: kind of like in a movie when the mafioso hit man says to someone: does your kid like his new school? be a shame if he had an accident during recess. Why Stay In Bet Shemesh? Are You Allowed To Make Up Your Own Mind? Who Is Responsible For Extremism? What Else Do These Doctors Have In Common? What Is The Best Aliyah for a Neshamah?